Raspberry Ridge Golf is considered the Best 9- Hole golf course in Washington!. Excellent drainage, tournament conditions daily and value makes this 9 hole, par 34 course, located between Bellingham and Lynden, the best deal in the area. The 5,170 yard course is very well maintained and features a modest pro shop, great restaurant, enormous greens, spectacular views of Mount Baker, open fairways and just enough sand and water hazards to create some interesting challenges and features. The course was designed by well known golf architect Bill W. Overdorf along with the vision of owner Bill Robins Sr.
Robins' love for the game gave him a vision of building a golf course out of his raspberry farm. His vision came to fruition in the fall of 1984 when the course opened. 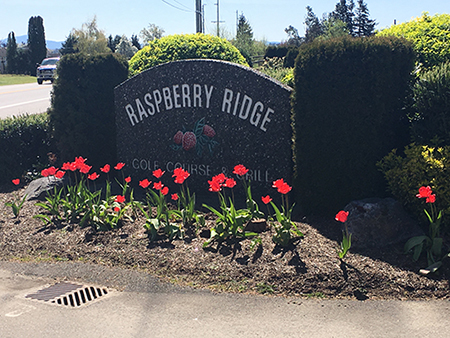 Since opening Raspberry Ridge Golf Course and Grill it has become one of the most respected and popular golf courses in the area. If you like golf and have never played the course - you won't be disappointed. Raspberry Ridge is still locally owned and family operated by the Olson's since 2001. "We want to provide the best golfing experience we can at an affordable price." Raspberry Ridge plays in about two to two and a half hours and is a great choice for any time of the year. It is a great place to get back into the swing of the game for both beginners and serious golfers. It offers great golf for an even better value. This course you'll want to play again and again!